Definition at line 36 of file sampleCompRight.h. Definition at line 55 of file sampleCompRight.cc. 69 *inbetween the top and bot grid lines or not. 89 //which is strictly above midIndex1. Definition at line 403 of file sampleCompRight.cc. 500 //this following code cannot be reached, but leave it for debuggig purpose. 515 //use one (begin), we would output degenrate triangles. 524 //now from j+1 to end is strictly U-monotone. Definition at line 380 of file sampleCompRight.cc. Definition at line 270 of file sampleCompRight.cc. Definition at line 221 of file sampleCompRight.cc. 257 //output the fan of the grid points of the (i)th and (i-1)th grid line. Definition at line 305 of file sampleCompRight.cc. 359 //sample one trm edge region. Referenced by sampleCompRight(), and sampleRightStripRecF(). Definition at line 581 of file sampleCompRight.cc. 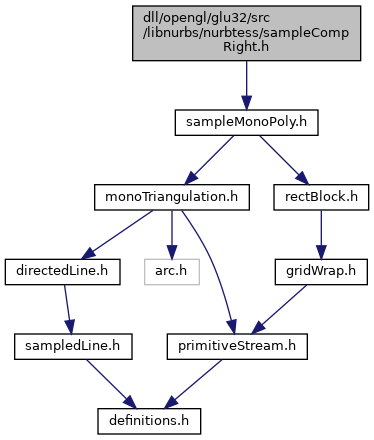 Referenced by sampleBotRightWithGridLinePost(), sampleCompBot(), sampleCompTop(), sampleRightOneGridStep(), and sampleTopRightWithGridLinePost().